In June of 2013 I wrote about the maturing of Google’s Panda algorithm and how it started to roll out monthly over a ten day period. Google also explained at that time that they wouldn’t be confirming future Panda updates. In my post, I explained how the combination of monthly updates, over ten days, with no confirmation, could lead to serious webmaster confusion. Getting hit by Panda was already confusing enough for webmasters (when they knew it was Panda). Now sites could get hit during a ten day period, any month, without confirmation from Google about what hit them. So the monthly updates went on, I picked up a number of them, and yes, it was confusing for many. I received plenty of emails from business owners wondering why they experienced drops during those unconfirmed updates. In case you’re wondering, I could pick up those unconfirmed updates since I help a lot of companies with Panda and I have access to a lot of Panda data. More about that soon. But the average webmaster could not easily pick up those updates, which led to serious confusion and frustration. And that’s the situation we were in until May of 2014. This went on until Panda 4.0, which was a huge update released on May 20, 2014. Google did announce the update for several reasons. First, it was a new Panda algorithm. Second, they knew it was HUGE and would impact many websites (and some aggressively). Everything about the update was big. There were huge recoveries and massive new hits. You can read my previous posts about Panda 4.0 to learn more about the update. But that’s not the focus of this post. Something else has been going on since Panda 4.0, and it’s critically important to understand. 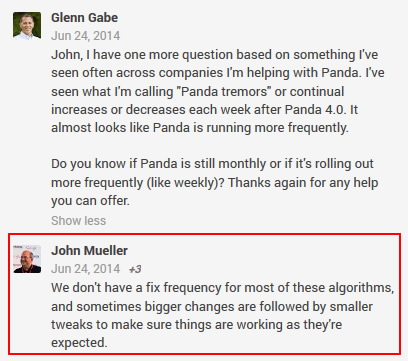 After Panda 4.0 rolled out on May 20, 2014, I noticed that sites impacted by the algorithm update were seeing continual “tremors”. Sites that were hit were seeing more drops every week or so and sites that experienced recovery also saw tremors during those dates (slight increases during those intervals). Moving forward, I also started to see sites reverse direction during some of the tremors. Some that saw recovery saw slight decreases and others that were hit saw slight increases. It was fascinating to analyze. I reached out to Google’s John Mueller via G+ to see if he could shed some light on the situation. Well, he did, and I documented his response in my Search Engine Watch column soon after. John explained that Google doesn’t have a fixed schedule for algorithm updates like Panda. They could definitely tweak the algo to get the desired results and roll it out more frequently. That was big news, and confirmed the tremors I was seeing. And based on what I’ve been seeing across websites impacted by Panda, he’s not kidding. You can see the video below (starting at 21:40). Since Panda 4.0, I’ve seen tremors almost weekly. And guess what? They really haven’t stopped. So it seems they aren’t temporary adjustments to Panda, but instead, this could be the new way that Panda roams the web. Yes, that would mean we are in the age of a near-real-time Panda. And that can be both amazing and horrifying for webmasters. I mentioned that I have access to a lot of Panda data. That’s because I’ve helped a lot of companies with Panda since February of 2011, while also having new companies reach out to me about fresh Panda hits. This enables me to see recoveries with companies that are working hard to rectify content quality problems, while also seeing new Panda hits. This combination enables me to document serious Panda activity on certain dates. Since Panda 4.0 rolled out, I have consistently seen tremors (almost weekly). I have seen companies continue to increase, continue to decrease, fluctuate up and down, and I have also documented temporary recoveries. Below, I’ll show you what some of the tremors look like and then I’ll explain what this all means. So, what does this all mean for webmasters and business owners? Well, it means that Panda is rolling out often, and sites can be impacted more frequently than before. That’s huge news for any webmaster dealing with a Panda problem. In the past, you would have to wait for a monthly Panda update to run before you could see recovery (or further decline). Now you can see impact much more frequently. Again, this is big. That’s why I have seen sites fluctuate almost weekly since Panda 4.0. Some have stabilized, while others continue to dance with the mighty Panda. And the temporary recoveries emphasize an important point. If you haven’t completed enough Panda recovery work, you might see what looks to be recovery, only to get hammered again (and quickly). It’s one of the reasons I explain to Panda victims that they need to move quickly and implement serious changes based on a thorough Panda audit. If not, they are setting themselves up to continually see declines, or worse, see a misleading temporary recovery, only to get smoked again. As I explained above, it looks like a new phase of Panda has begun. As someone neck deep in Panda work, it’s fascinating to analyze. 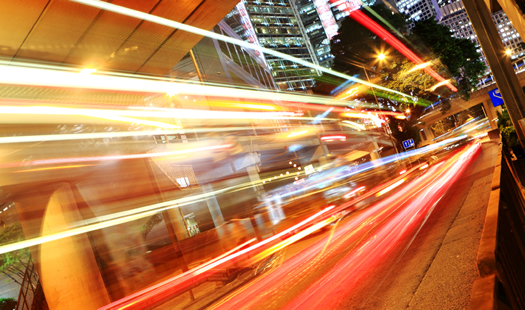 With the mighty Panda roaming the web in near-real-time, websites can see ups and downs throughout the month. They can get hit, or recover, or even see both in one month. That’s why it’s never been more important to address content quality problems on your website. As always, my recommendation is to focus on user engagement, nuke thin and low quality content, remove deceptive tactics, and win the Panda game. Let’s face it, Panda has upped its game. Have you?